OK, I have to post this recipe. Handyman made these for my Mother's Day dessert and I just made them again last night to accompany our Sunday night dinner. This strawberry shortcake was the perfect combination of yummy to easy-to-make ratio. 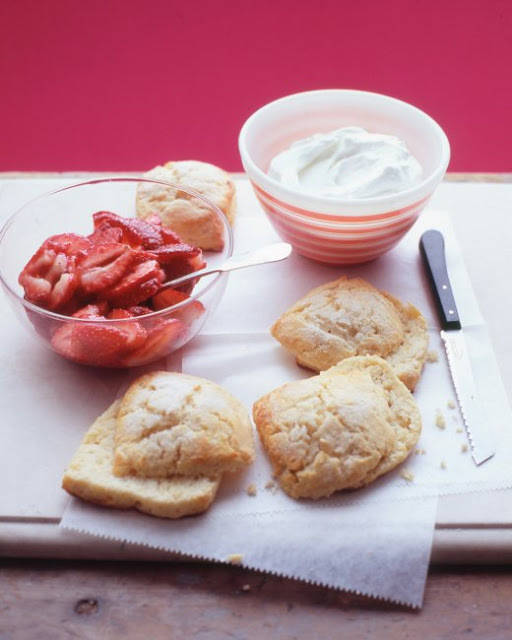 On Mother's Day, all we had on hand was vanilla ice cream, so thus short cakes a la mode. Last night we had some cream that I quickly whipped up. Both ways are equally delicious. And a different take then these raspberry shortcakes I've made before. -Don't be scared, but the dough is really wet and sticky. Keep your flour out and accessible as you shape and cute these little babies. Preheat oven to 425 degrees. Make the sweetened strawberries: Hull and quarter strawberries; toss in a medium bowl with 1/4 cup sugar. Let stand until syrupy, tossing occasionally, at least 20 minutes (and up to 1 day, covered and refrigerated). In a food processor, combine flour, butter, 1/3 cup sugar, baking powder, and salt; process until mixture resembles coarse meal. Add milk; pulse just until moistened, 4 or 5 times. Do not over process. Turn out dough onto a lightly floured surface; with floured hands, gently pat dough into a 4-by-8-inch rectangle. Dust a large knife with flour; cut dough into 8 squares. Transfer to a baking sheet; sprinkle with 1 tablespoon sugar. Bake until golden, 25 to 30 minutes; cool on baking sheet. To serve, split biscuits with a serrated knife; layer with berries and Whipped Cream. Yum. We love strawberry shortcake.